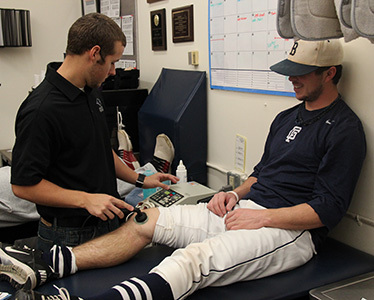 To be eligible to apply for the Athletic Training Program, students must complete a minimum of 25 observational hours in the athletic training room or at clinical sites on the George Fox University campus, i.e., soccer practice. Students make formal application for admission to the Athletic Training Program through the program director in the spring of their freshman year. Application must be made by April 1 of the semester prior to formal entry into the Athletic Training Program. Students are given notice from the program director regarding their admission after final grades have been verified at the completion of the semester. Admission to the program is based on a minimum cumulative GPA of 2.75 or better on all college-level courses including required prerequisites (PSYC 150, HHPE 390, and HLTH 233); two written recommendations; two written essays; meeting technical standards as described in the Athletic Training Program Policies and Procedures Manual; good standing with Student Life as described in the George Fox University Student Handbook; and submission of the formal application no later than April 1. Generally, any application submitted after April 1* will not be considered for admission the following school year. Admission to the program is required before applicants may enroll in practicum courses and begin gaining clinical experience hours as athletic training students within the Athletic Training Program. *Applications submitted after April 1 will be considered if fewer than ten candidates have applied. A maximum of 20 qualified students will be admitted to the program each academic year. In addition to the application form, the following items must be included to be considered for admission into the athletic training education program. A typed essay no more than 200 words in length on your perception of the role of the athletic trainer. A typed essay no more than 200 words in length on why you feel you should be accepted as a athletic training student.